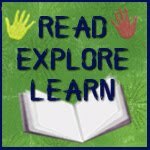 This week our Eric Carle book was The Mixed Up Chameleon. In this story, a chameleon not only changes colors, he adds attributes of other animals. For instance, when he says, "I wish I could swim like a fish", he grows fins. In the end, he learns that he needs to just be himself in order to get what he needs. After reading the book, we explored changes. 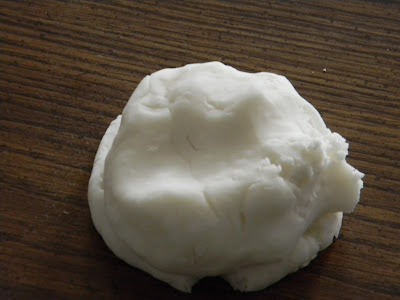 I made some playdough using this recipe. Look, I got a new camera!! You can actually see my pictures!!! ﻿ I divided the playdough into four parts and "hid" some food coloring in the center of each part of playdough. 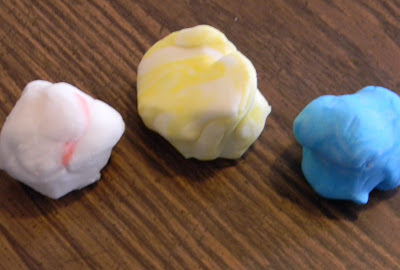 As we kneeded the playdough, it changed colors. 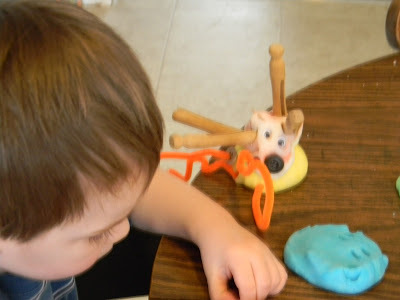 I helped the boys make a connection to the text by saying things like, "Look, the playdough is changing colors just like the mixed up chameleon changed colors in the book." (This could make a great link into animal adaptations or camaflouge). sorry about the runny nose... the new camera captures the good, the bad... and the ugly! Then I invited Logan to create a new character. I included wiggly eyes, feathers, pipe cleaners, beads, sequins, tooth picks, and clothespins in a tub for him. As he was creating I would say, "Oh, that hair looks like a porcupine." Sometimes he would contribute his own ideas like, "No, it has hair like a bird." We tried to stick with Carle's writing structure of "I wish I had ____like a _____" as we talked about our creatures. could either just fill in the blanks or write their own descriptive paragraph of their new creature. It might look something like this. It has ___(hair)_____ like a ______(bird)___________. It is _______(funny)_____ like a ______(seal)_____________. (an example from Carle's book). How Lovely! 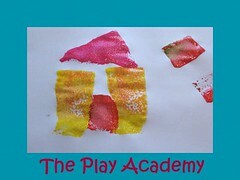 Love the idea of making the playdough change colour! Brilliant. 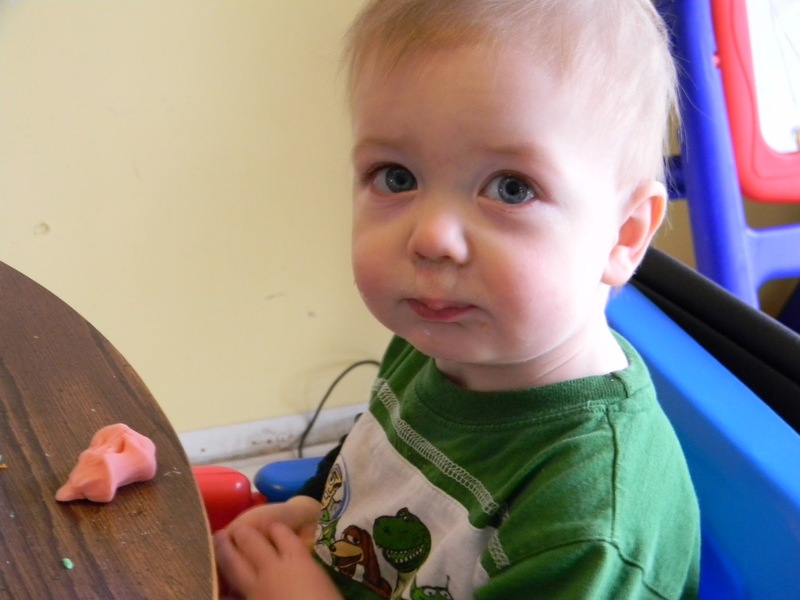 And playing with playdough is always fun!! 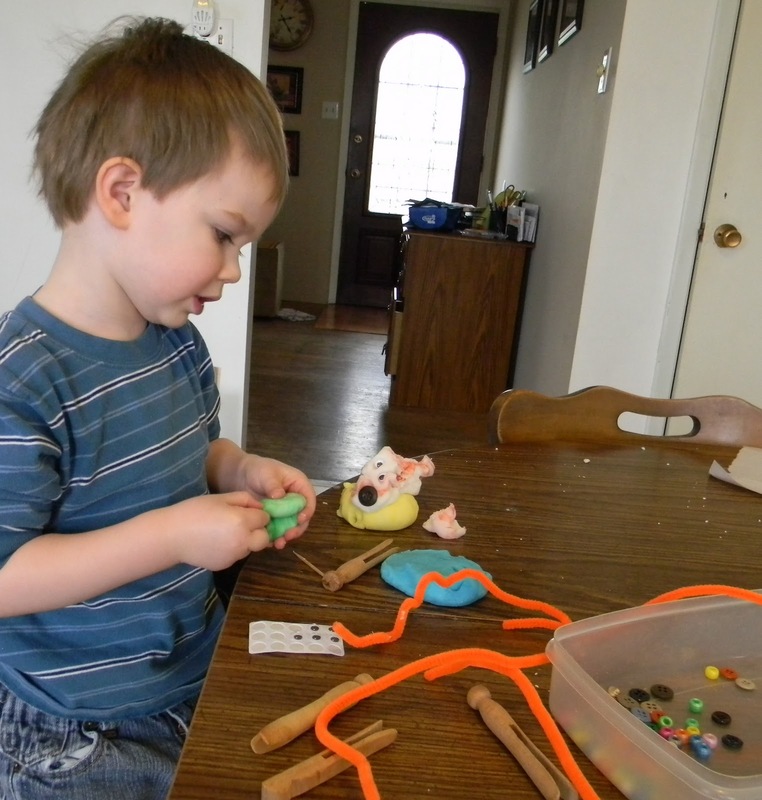 We love mixing colors in the playdoh here, and the pretend creature is adorable! I love the idea of do a writing project with the creatures created.